There are as many reasons guys and gals choose to drive a big rig for a living as there are truck drivers! Here's a few of the perks of truck driving for a living. 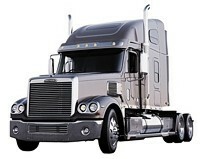 One of the most common reasons to get into trucking is the desire for independence and the ability to suceed. You do not have a manager watching everything that you do. A truck driver can set their own schedule and make many of their own decisions. You do have rules and regulations that are imposed and you have someone scheduling you but for the most part you are on your own and you control your own success. For example, if a truck driver starts out early Monday morning, drives his allowed hours, sleeps and resets, and the regulations says he can drive at 2am, the company may insist that the driver start their shift at 2am in order to meet a pick-up or delivery appointment. This scenario is really starting to take away some of the appeal of a truck driver career. It certainly doesn't have the appeal for this reason, that it once did. However, on the bright side, owner operators are still able to have somewhat more control over their own schedules, other than what the electronic logs dictate. However, the overall trend in this industry seems to be heding toward the professional driver being dictated by a computer. The money is still prety decent, considering you do not have a huge amount of money invested in years and years of education or training. Once a Driver is trained and licensed, they can start earning money. Its not quite that easy because of all the insurance regulations on companies now some companies cant hire you until you have experience. Well if you cant hire me how can I get the experience? You find an owner operator that needs a team driver, you find a company that takes drivers just out of school. It may not be be the best method but it is a stepping stone to your travel. Where else can you get paid to drive and see the country? Every day is a new book and a new experience that broadens your thoughts. Even in this todays economy, there still lots of trucking jobs, and although they may be harder to get now you can feel more stable because trucking is starting an upswing as you read this. A commercial driver's license not only gives a driver plenty of job opportunities, but there's some satisfaction knowing that if you don't like the company or people you're working for, you can always find another one.